While the term “most intelligent” will be questioned by some parrot owners, a lifetime of working with birds in zoos and at home leaves me in favor of granting several Corvids (crows, ravens, jays and their relatives) that honor…no disrespect to the amazing abilities of other birds! My fascination with this bird family began when I took in nestling American Crows and Blue Jays as a child, and continued through work with their exotic relatives at the Bronx Zoo. In Japan, I was astounded by the tool-using wild Carrion Crows (please see article below). Among the most captivating of all is the amazingly-intelligent and curious Hooded Crow (Corvus cornix). Large, active and (very!) expensive, Hooded Crows are not for everyone, but the experienced aviculturist can ask for no finer or more responsive pet. Once seen, this spectacular bird will not be forgotten. The head, wings, chest and tail are clad in typical Corvid glossy black, which is nicely-offset by the light to dark gray plumage (sometimes un-flatteringly described as “dirty grey”!) covering the rest of the body. It reaches nearly 2 feet in length, and sports an impressive wingspan of 36 to 40 inches. Long considered to be a color variant of the Carrion Crow (C. corone), the Hooded Crow is now recognized as a distinct species. Four subspecies have been described. The Hooded Crow’s huge range extends from Great Britain to western Asia (the western edge of the range is not well-defined) and from just south of the Arctic Circle to the southern coast of the Mediterranean. Those populations that migrate in winter reach northern India, southern China, Iran and Afghanistan. Hooded Crows seem to favor open forests and wooded scrub, but are very adaptable, colonizing farms, villages, brushy grasslands, desert fringes and cliffside forests at 3,000 feet or more above sea level. Although generally described as “stick nests”, those constructed by the Hooded Crow are actually very complex structures. The foundation is usually of short, stout sticks, but animal bones may be incorporated – in some areas, this habit has given rise to some odd superstitions, as can be imagined! Several distinct layers are placed over the foundation, with moss, grasses and roots used as binding materials. The inner cup-like area is lined with feathers, fur, wool and/or discarded rags and the like. The eggs, numbering 2-7, hatch in 18-20 days, and the chicks fledge at 4-5 weeks of age. Even casual observation of wild individuals will reveal crows to be unusually intelligent. In fact, recent studies have shown their tool-making and problem-solving abilities to be on par with those of some great apes (please see articles linked below). Uploaded to Wikipedia Commons by Thermos. Like most if not all of its relatives, Hooded Crows are excellent mimics, and readily copy sounds and words. Naturally social, crows quickly bond to their owners and may even learn to respond to simple commands. Although they can become quite bold – free-ranging pets often torment dogs, cats and human visitors alike – their great intelligence is accompanied by a sensitive nature. For all their toughness, Hooded Crows are easily stressed by unkind behavior (real or perceived!) on the part of their owners…and they will not forgive or forget! As is true for young children, their active minds have the capacity for both learning and mischief. Indeed, Hooded Crows seem driven to manipulate, and if possible destroy, anything they can get their powerful beaks upon. This is an outgrowth of their natural behavior, and cannot be “trained” away. Hooded Crows should never be left at large in a room that is not completely “crow-proofed”. Before allowing your bird access to a room, go through it as if you were about to release a gang of toddlers, and then check again! Hooded Crows are large and very active, and need plenty of flight space. A custom-built or commercial outdoor aviary, or a properly-outfitted indoor room, is the only option for a pet Hooded Crow. Commercial cages designed for even the largest macaws fall far short of their needs. Hooded Crows kept outdoors tend to be very vigorous. Although they readily adapt to cold weather, heated shelters should be available during winter. Given their wide range, it is likely that individuals from southern populations may be somewhat cold-sensitive, so try to determine your pet’s origin if possible. Indoors, Hooded Crows are best located where they can observe people…they also take an interest in televisions and phone conversations. Even if provided adequate space, Hooded Crows will languish if not stimulated by toys, behavioral enrichment, and out-of-cage time. Daily interaction with people is essential if they are to remain handle-able. Concerning handling, it must be understood that the beak is a formidable weapon, and that even accidental injuries can be VERY severe. It is critical to keep one’s face and eyes out of reach, and to understand that crows cannot be trusted in this regard. Please post below for further information on handling. Although they take an incredibly wide range of foods, Hooded Crows have distinct carnivorous leanings. Rodents, carrion, eggs and insects form a large part of the natural diet. Crow owners have had success with diets based on cat and dog foods, but I prefer a diet similar to that I’ve used for many crows, magpies and jays in zoos. Commercial bird-of-prey diet, into which I mix pigeon pellets and softbill food, provides the bulk of their food intake. I believe that whole mice or chicks and insects are essential in assuring proper calcium intake and long term health. Tossing a handful of crickets or other insects into your crow’s aviary is a wonderful way to keep the bird occupied. Canned grasshoppers, snails and other invertebrates can be used to provide critical dietary variety. A wide range of vegetables, chopped nuts, and fruits (in moderate amounts) should also be provided. Hard-boiled eggs are an especially favored treat. The Hooded Crow’s natural diet contains a good number of whole animals, and is likely calcium-rich. In addition to pink or adult mice, pets should receive calcium and vitamin/mineral supplements. Natural sunlight and full spectrum bulbs should also be provided. Do Tool-Using Crows Surpass Parrots and Apes in Intelligence? 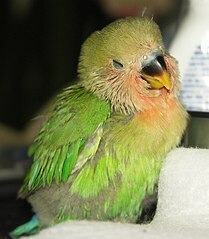 Wintertime always brings a spike in posts and calls concerning sick parrots. I often tap avian veterinarian friends for assistance, and most also report seeing more ill birds at this time of year. Respiratory ailments seem to dominate, and many owners attribute this to drafts and low temperatures (as we’ll see, this is not actually the case). While otherwise-healthy people tend to shrug off “winter colds” as an annoyance, the dangers that respiratory illnesses pose to parrots, finches, doves and other pet birds are extremely severe. Left untreated, these infections will always worsen over time – usually quite quickly – and will often prove fatal. Also, as it is impossible to distinguish, via symptoms, common respiratory concerns from psittacosis and other diseases that may be transmittable to humans, a prompt call to your veterinarian is always in order. Are Drafts and Cold Temperatures a Concern? Drafts and rapid changes in temperature do not specifically cause birds to suffer respiratory distress. However, they can stress the immune system. The same may be said of birds that are kept, long-term, at lower-than-optimal temperatures. Tolerance for such conditions varies by species. If the immune system is over-worked or otherwise compromised, bacteria, parasites and fungi, which are ever-present in the environment, can take hold and sicken your pet. Minor underlying health problems, which may have been suppressed by the immune system when all was well, may also become severe. So, while drafts and such may not actually cause illness, they do “set your pet up” to become sick. Please see the article linked below for further information on heating your bird’s cage or bird room. Acclimation to colder-than-recommended temperatures is often possible, at least with some species, but this must be done properly; please post below for further information. Most bird owners quickly know when all is not well with their pet. While respiratory ailments can be caused by a wide variety of pathogens, the symptoms are similar. Puffed feathers, wheezing, nasal discharge, sneezing, coughing, appetite loss and/or general lethargy are the most common warning signs. Tumors, smoky environments, and even allergies and less-common problems may also be involved. 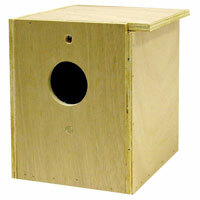 Your first step should be to speak with an experienced avian veterinarian. A specialist is preferable, as the causative agents of respiratory diseases can be difficult to identify, and some illnesses are more commonly seen in certain bird species or families than others (please see photo of heron afflicted with chlamydiosis). Please post below if you need assistance in locating a local avian veterinarian. Do not take any steps to treat your bird before speaking with your vet (other than eliminating drafts, etc.). You may be instructed to clean your bird’s nares (nostrils) or raise the temperature a bit, but do so only after consultation. Common avian bacteria can cause serious problems if, for example, they become established in one’s eyes, and the risk of a zoonotic disease (one that can be transmitted to people) must be considered. Your vet can advise you as to appropriate precautions if any type of home treatment is recommended. Of course, an appointment with the veterinarian should also be scheduled. Why is My Parrot Sneezing?